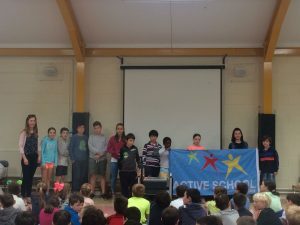 During an accreditation visit on 12th June, the Junior Active School Committee, spearheaded by Ms. Audrey Coe, delivered a powerpoint presentation about the team effort from pupils, parents and staff along with the numerous events organised to promote activity in the school. The inspector visited the PE hall and store room, Active Display Board and several classrooms, where she was delighted to observe a 1st Class orienteering lesson, 2nd Class bouncing tables and Irish games and the 3rd Class “well done wall”. She also commented positively about the volume of activity on view at break time and the impressive playground markings. At this week’s senior assembly, Ms. Coe revealed that the concerted effort over the past three years has earned Taney the Active School Flag. She and the Committee received a very warm and well-deserved round of applause for this fantastic achievement and well done to everyone who contributed to this endeavour.